In terms of oral health conditions, gum disease is somewhat overlooked. Sure, most people probably have heard of gum disease, and some will know exactly what it is and what it can do to your mouth. However, when compared to something like a cavity, the general population is pretty much in the dark on this topic. That’s a shame, of course, as gum disease is a serious condition that should be treated right away. With this post, we will provide some basics on how gum disease can be treated. 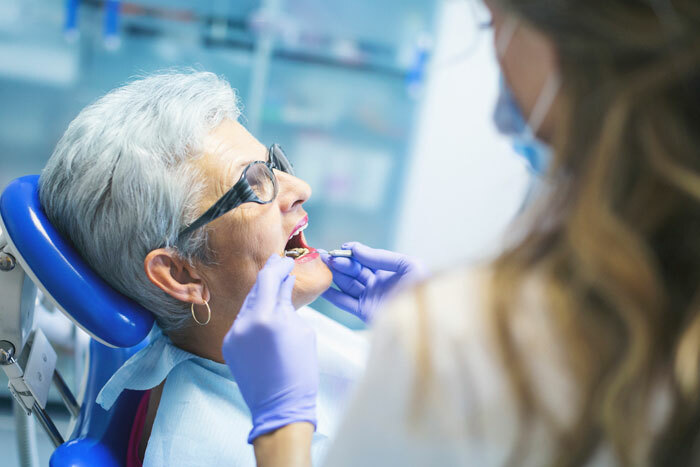 The exact treatment suggested for your situation can vary depending on the severity and other related factors, so working together closely with your dentist is a good idea. There are two forms of gum disease1 – gingivitis, and periodontitis. The former is not as severe as the latter; however, each should be addressed right away. Gingivitis occurs when the issue remains only in your gums, and it turns into periodontitis when your infection goes below the gum line and down into the bone below. Perhaps surprisingly to some people, statistics seem to show a correlation between gum disease and things like cancer and heart disease, which is all you should need to know in order to take this issue seriously. If you notice any of the symptoms above, it’s almost certain that something is going on with your oral health. It may or may not be gum disease, but the proper next step is to visit your dentist for a thorough examination. Given the fact that gum disease is rather common among the adult population, this is an issue which you very well may need to face at some point in the future. Preventative treatment is the best course of action for those who are not yet afflicted with gum disease. If you can stay ahead of it and take actions on a daily basis to improve your oral health, you may be able to steer clear of this problem altogether. Fortunately, the things you need to do to reduce your chances of gum disease are the same things that you should already be doing for your overall oral health. Brush! You knew this was going to be first on the list. By brushing your teeth twice per day – and brushing properly – you are going to remove food particles and plaque from your mouth. This is an extremely important habit to establish, and the sooner you can get started with twice daily brushing, the better your oral health is likely to become. Floss! In addition to your twice-per-day brushing habit, try to get into the habit of flossing once per day, as well. Many people ignore flossing altogether, or they only floss after a meal that they feel left food trapped between their teeth. If you can commit yourself to learn how to floss properly, doing it once each day won’t seem like such a chore. Add mouthwash to the equation. As the third piece of the daily oral hygiene puzzle, mouthwash can do a great job of reducing plaque buildup in your mouth. This is a good time to add that it is very important for tobacco users to work on breaking that habit as quickly as possible. Not only is tobacco use associated with a long list of other serious health problems, it can contribute to the issue of gum disease. It’s a great thing to take your oral health into your own hands. You obviously need to seek the help of a professional when you need treatment or a cleaning but doing what you can at home only takes a few minutes and it can make a huge difference. Don’t wait any longer to improve your habits! For those who are having issues with their gums, a comprehensive periodontal evaluation is a logical next step. This exam is going to help the dentist understand the severity of your gum disease, so plans can be made to move forward. Once your gums have been evaluated, you will be able to speak with your dentist about what kinds of care options are available in your case. The specific treatments available are going to depend on the current status of your gum disease, any other oral health issues you may be facing, and more. While it’s impossible to stay what kinds of treatments will be appropriate for your situation, we can talk generally about what can be done to treat gum disease. For one thing, a professional cleaning is often in order. The combination of a professional cleaning along with some tips on improving your day to day oral hygiene can go a long way toward fighting back against gum disease. Another potential option is the use of medication to control the infection in your gums. In severe cases, it may be necessary to undergo periodontal surgery. This is essentially the last step along the process if the less invasive steps have failed to produce results. Just like any other kind of surgery performed on your body, you’d rather avoid this outcome if at all possible. Hopefully, by keeping up with daily hygiene and getting help from your dentist, you will be able to solve the problem without surgical intervention. If you are struggling with gum disease, or if you simply think you may have a problem and you would like professional assistance, the team at Spokane Dental would be proud to help. Getting started is easy – just give us a call2 during normal office hours to ask any questions you may have, or to make an appointment. We appreciate the time you have spent on our blog, and we hope to serve you soon! How to know if a Dental Implant is for you? How Does Restorative Dentistry Help You?